See our 12-13 Week Videos page for videos of past Summer Brook 13 Week Old Trained English Golden Retriever Puppies. See our 10 Week Old Trained English Cream Golden Retriever Puppies page to see what will have already been taught by 10 weeks of age. The three weeks from 10 to 13 weeks build on those skills. Our training methods do not rely on the old-fashioned “pack leader” mentality. Instead, we heavily use control rather than punishments. For example, we teach them to wait before eating in a crate by physically not letting them get to the bowl before we release them. 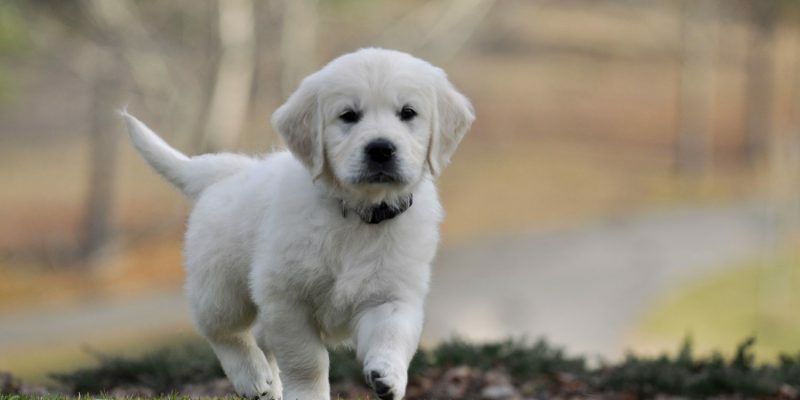 Our trained English Cream Golden Retriever puppies are taught to wait until their names are called or until they hear a release command before passing through doors and gates. Again, we physically keep them from having an opportunity to pass through the gate. We focus on teaching puppies that all things are ours and that we share them at our discretion with the same methodology. We don’t punish puppies for failing. They don’t fail. We physically keep them from it. We use leashes, pens, and crates instead of old fashioned training methods such as the alpha roll and other punishments. The puppies begin to learn to take treats gently, not to jump or mouth, and not to chew furniture. Starting when puppies are 8 weeks old, we don’t pet them or give them attention unless all four of their feet are on the floor. By 9 weeks, we require puppies to sit for attention. We don’t allow puppies to chew on us (ever) and if they do, we walk away. For those puppies that are insistent on mouthing us, we just stand back from them until they relate to us without their mouths. By using a pen or gated area, the puppies cannot get to us until they behave. We don’t teach an off command. We believe that it is better to teach puppies never to jump on you to begin with. When they chew on inappropriate things such as furniture, we use a “no” command and redirect them to something appropriate to chew. They learn sit, down, stay, wait, walk on a leash, and come when called. The most important command we teach our young puppies is to focus on us and to understand the look command. We also teach puppies the word no. A wide variety of people give our puppies love and attention. We also socialize them with several gentle dogs. We begin crate training by feeding puppies in crates before they are six weeks old and use positive methods to foster a love of a crate. Our puppies are not closed in crates overnight until they are about 12-13 weeks of age, just before going home. Before this, they have free access to the outside through a doggy door at night time. During the day we work on building crate desire and bladder control. During the day-time starting at 10 weeks, we make heavy use of crates and pens. Puppies spend daily time in obedience training sessions, socialization sessions, time in crates, meals in crates, quiet play in pens (separately and in pairs) with toys, and free play with each other with access to both inside and outside through a doggy door. All of this is interspersed with many trips outside to potty. What can you expect from one of our 13 week old trained puppies? At 13-weeks, puppies will sit for attention, come when called, and sit and down on command at my home and with me. However, if you have little experience with training dogs, your puppy might not respond the same way with you as he does with me. We will therefore spend time with you when you pick up your puppy to show you how to work with your puppy and teach you to continue the training yourself. Though puppies leave us with a good start, they will forget what they’ve learned without contenued practice. They are too young for what they’ve learned to have become a true habit. Will the Puppies Be House Trained at 13-Weeks? When one of our 13-week old puppies goes home, you can expect that he will consistently do his business outside if you are consistent to take him outside frequently. Most puppies at this age need to go out about every hour if they are loose in the house. Some puppies have to go out every 45 minutes. Some will hold it inside for 2 hours or more. 13-week old puppies are able to have a two-hour nap in a crate and because we’ve spent so much time with positive experiences in the crate, very few of ours whine during crate-time. Between 12 and 13 weeks of age, we begin crating them overnight. Our night is about 7 hours long. Almost all of our puppies sleep quietly during these 7 hours. Most, if not all of our puppies could probably go longer. They rarely complain about being in the crates when I get up in the mornings and they are used to sitting in crates for up to an hour before I let them out. (I don’t walk into the kitchen to find them chomping at the bit to get out of their crates.) At 13-weeks, puppies have small bladders and they will have accidents if you aren’t consistent to get them outside frequently. Though there is still a lot of work to be done at this age, we’ve done the necessary work during the hardest 5 weeks and we are available to give advice on how to continue it. Please also read our section on our 8-10 Week Training Program for what our training DOES NOT include. 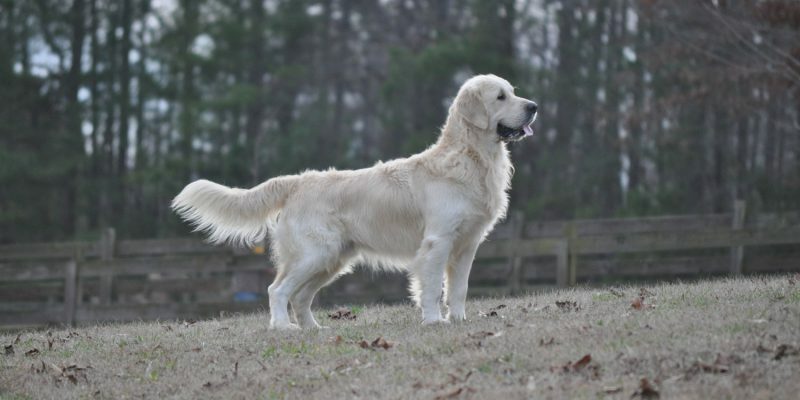 See our Trained English Golden Retriever Puppies page for more details on our overall program. 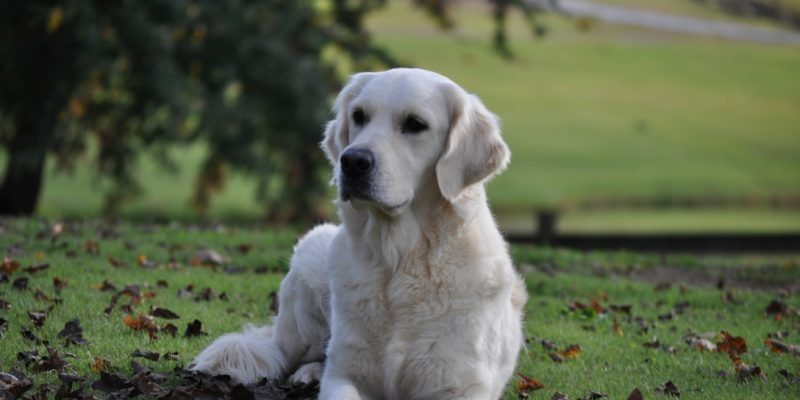 Our goal is not simply offering “Trained English Cream Golden Retriever puppies for sale”. We provide companions for people who want to spend time with a dog. Our training program builds on the good genetics and strong early foundation given prior to 8 weeks to further that goal.